A glitzy drama and clunky romance set in the world of elite navy aviators, Top Gun has all the slickness of a polished sales pitch, and all the emotional depth that can be expected when hardware is the subject of worship. Pete "Maverick" Mitchell (Tom Cruise) is a cocky, instinctive naval pilot, living under the cloud of his father, also a Navy pilot who died in mysterious circumstances. Maverick flies F-14A Tomcats with his Radar Intercept Officer (RIO) Nick "Goose" Bradshaw (Anthony Edwards). After a close encounter with enemy MiG 28s over the Indian Ocean, Maverick and Goose are chosen to join the elite "Top Gun" aerial combat training school at Miramar, Florida. The intense training features numerous flights to sharpen dogfighting skills, overseen by the legendary "Viper" (Tom Skerritt) and "Jester" (Michael Ironside). 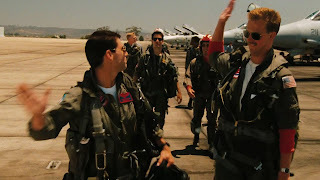 Maverick finds himself in an alpha male competition with Tom "Iceman" Kazanski (Val Kilmer), a more cerebral pilot, for the prize of top graduate. Maverick also starts a steamy relationship with Charlotte "Charlie" Blackwood (Kelly McGillis), an astrophysicist and civilian instructor. With the course drawing to a close and Maverick locked in an intense competition with Iceman, tragedy strikes, severely shaking Maverick's self-belief. A thrilling piece of 1980s confectionery, Top Gun is ridiculous, mindless fun. Every man has a hokey nickname, every woman melts in front of the military uniforms, and every line of dialogue is cringe-worthy. The romance is klutzy, Kelly McGillis puts herself in the running for least convincing astrophysicist in film history (have there been others? ), and the music serves as a reminder about how terrifically awful 1980s soundtracks could contrive to be. The geopolitics are at kindergarten level while the manly competitions make it all the way to Grade 8 maturity. And yet. 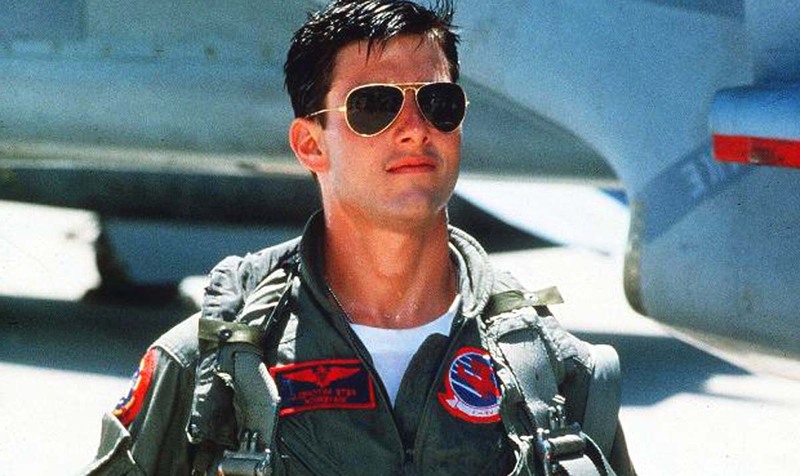 There is something about the unabashed gloss of Top Gun that allows it to rise above. 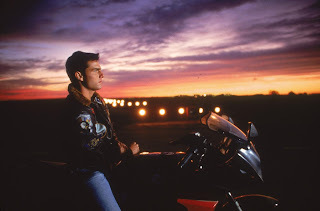 Director Tony Scott displays a genuine flair for transforming lethal machinery into objects of desire, and Top Gun is filled with quite magnificent aerial photography. The glistening sun, the open skies, the golden silhouettes, and the roar of overpowered fighter jets designed to manoeuvre and kill with maximum efficiency are combined to create an irresistible aesthetic. As an advertisement for life as a navy pilot, the film is an undisputed winner. Which all means that the story is utterly irrelevant, and serves as a distant backdrop to the sexually charged engines and people. And it's really best not to look too closely at all the decisions made by the military brass, culminating in sending young men off to war on their graduation day and shoving a pilot into combat while he is in a near catatonic state. It's drama torn from the pages of ideas too foolish to be considered as comics. Tom Cruise continued his rapid rise to the very top with a magnetic performance as the moody, motorcycle-riding, Ray-Ban wearing Maverick. He does not need to act as much as be present and allow his natural pizzazz to glow, and he just radiates energy on the ground and in the sky. Val Kilmer displays a different kind of intensity, still charismatic but adding a snarly meanness. The other guys range from marginally goofy (Edwards as Goose) to pure macho (Skerritt and Ironside, taking it all too seriously). The black hole is Kelly McGillis, and she threatens to swallow up the entire film with a stunningly unconvincing performance that screams vapid love interest, with Charlie reduced to a ten year old's idea of a fantasy woman. Deep in the cast, Meg Ryan shows up as Goose's wife and Tim Robbins makes a late appearance as a co-pilot. While most of the individual elements fall flat, as a whole Top Gun amounts to a nonsensical success story. The film rides a crazy, unapologetic energy, buying into its own boyish joy, taking the breath away and inviting all to be swept into the thrill of the danger zone.